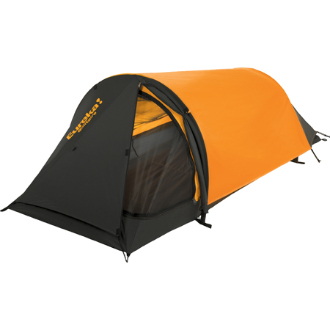 This 3 season, solo tent with efficient tunnel design and compact fold size, is extremely lightweight. Two storage pockets and flashlight loop inside. Added zipper in center of roof allows easy entry and exit. Pole pockets on one end, ring & pin on the other. Shockcorded 6.3 mm fiberglass frame. Three storm guy outs on fly. 2'4" H x 2'8" W x 8' L. Weight: 2 lbs 9 oz.